A Soyuz rocket lifted off from Kazakhstan on Monday and delivered Europe's newest weather satellite into polar orbit, reinforcing the meteorological toolkit of forecasters around the world. 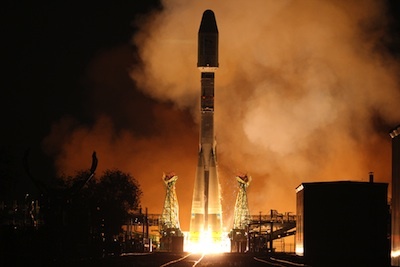 The commercialized Soyuz 2-1a booster launched at 1628 GMT (12:28 p.m. EDT), turned north from the Baikonur Cosmodrome in Kazakhstan, and climbed into a dark sky on the way to orbit with the second of three MetOp weather observatories for Eumetsat, the European weather satellite agency. Liftoff was at 10:28 p.m. local time in Kazakhstan. Shrouded inside the Soyuz rocket's payload fairing, MetOp B is a 9,005-pound spacecraft outfitted with eight instruments to survey clouds, winds, moisture, greenhouse gases, and other atmospheric conditions for at least five years. "This satellite is critical for forecasts from 12 hours up to 10 days," said Alain Ratier, director-general of Eumetsat. MetOp B was grounded for four months after the government of Kazakhstan held up the launch to negotiate an agreement on drop zones for the Soyuz rocket's first stage, which fell north of Baikonur. A Fregat upper stage fired two times to place MetOp B into a sun-synchronous orbit more than 500 miles above Earth, deploying the satellite about 69 minutes after liftoff. Starsem, an affiliate of Arianespace, managed the commercial mission. "We have demonstrated Soyuz is a very reliable launcher and is definitely the workhorse for mid-sized European spacecraft," said Jean-Yves Le Gall, chairman and CEO of Arianespace. MetOp B is replacing MetOp A, an identical satellite which launched in 2006 and is now beyond its design lifetime. "Because of the benefits of forecasts to the economy, and because of the impact of MetOp data in forecasts, we cannot afford losing a spacecraft in orbit with no replacement," Ratier said. Engineers at the European Space Operations Center in Darmstadt, Germany, acquired the first radio signals from MetOp B on schedule, verifying the satellite was healthy following its trip to space. One hour later, controllers announced the successful deployment of MetOp B's solar panel. Officials will hand over control of MetOp B from the European Space Agency to Eumetsat on Thursday, beginning an extensive six-week testing and calibration phase to activate the satellite's weather sensors and move it to its operational orbit. By the end of the year, MetOp B data will be distributed to forecasters around the world. Eumetsat expects to declare the observatory operational by next April or May, when MetOp B will formally replace MetOp A as the weather system's primary satellite. "Meteorologists use these weather models every day, and there is a combination of instruments on the MetOp satellite, which are very complementary, and together, they act to improve the quality of these numerical models which are used by the forecasters," said Florence Rabier, an expert on numerical weather prediction from Meteo France. Rabier said MetOp satellites improve the accuracy of forecasts, especially two or three days in advance. "This means the forecasts can anticipate the weather in a couple of days time, and this helps our job, which is to save lives and also to deliver benefits for weather-dependent activities, such as tourism, the economy, transport and energy," Rabier said. According to Rabier, studies by Meteo France and other agencies show MetOp A contributes more to 24-hour forecasts than any other data source. Weather satellites in geostationary orbit over the equator return nearly real-time imagery of storms, cyclones and other systems for forecasts on shorter timescales. Europe's MetOp satellite fleet works in tandem with spacecraft from NOAA - the U.S. government's weather agency - to provide data for global models predicting medium- and long-range weather. "MetOp is part of a joint integrated polar orbiting system shared with the Americans," Ratier said. "We have one European satellite and we have one U.S. satellite in different orbits. We get the extra benefit from the exchange of data products and operational support." Observations from two types of polar orbits, timed to cross the equator at 9:30 a.m. and 1:30 p.m. local time, are useful in obtaining data to improve weather prediction and the understanding of climate change. Polar-orbiting meteorological satellites fly in sun-synchronous orbits to ensure weather data are collected under the same solar conditions worldwide each day. The MetOp fleet covers the mid-morning orbit, while NOAA's satellites fly in the afternoon orbit. Instruments aboard the MetOp satellites come from ESA, Eumetsat, NOAA and CNES, the French space agency. Each MetOp spacecraft carries eight instruments. 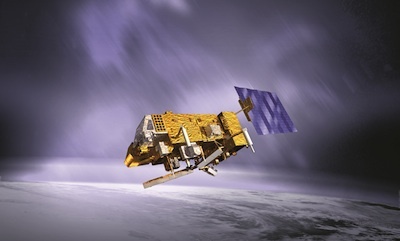 NOAA's contributions include MetOp's advanced very high resolution radiometer, or AVHRR, to collect imagery tracking cloud cover, sea surface temperatures, ice, snow and vegetation characteristics. The U.S. weather agency also supplies infrared and microwave sounders, which calculate temperature, humidity and pressure profiles within the atmosphere. CNES provided an advanced infrared atmospheric sounding instrument for MetOp. The French payload detects moisture and temperatures, greenhouse gases and ozone, and can map volcanic ash flows. Other European instruments include a scatterometer radar instrument to measure wind speed and direction over the ocean, a crucial data point for tropical cyclone forecasting. Under a new agreement with NOAA to use a U.S. data receiving station in Antarctica, MetOp data will be disseminated within 70 minutes, down from the program's initial 110-minute distribution time, according to Marc Cohen, associate director for Eumetsat's low Earth orbit programs. The MetOp program's three satellites, launch vehicles, ground segment and flight operations are projected to cost 2.7 billion euros, or nearly $3.6 billion, adjusted for inflation to 2011 levels. Eumetsat is responsible for about three-fourths of that cost, while ESA contributed the remainder. MetOp's third polar-orbiting satellite - MetOp C - will be called up for launch in 2017 or 2018 on a Soyuz rocket when MetOp B reaches the end of its lifetime, Cohen said. MetOp C will ensure Eumetsat's polar orbit satellite program remains operational into the 2020s. ESA and Eumetsat will propose a second-generation MetOp satellite program in November at a meeting of European space ministers in Italy.